27-20 win over South Carolina State: SC State also made the FCS playoffs. This was a back and forth game early and Coastal had to rally down 8 points in the 3rd quarter to tie the game up at 20. In the 4th they scored to grab a 27-20 lead. SC State on their last 3 possessions had two turnovers on downs and had to punt once. Both teams had a fairly balanced game and were within 5 total yards of each other. Coastal had a rough go of it on 3rd down conversions but went a solid 4-4 in the red zone. 35-28 win over Furman: Another FCS playoff opponent in Furman. This game was close but not as close as the score suggests. Coastal maintained either a 1 or 2 score lead from the late 1st quarter on, each time Furman would close the gap Coastal would answer. Despite all of that Furman did get a chance to tie it late but turned the ball over on downs. Furman rushed for 240, passed for almost 200. Each team had 2 turnovers. Furman had to be pretty burned up though, lots of errors, 4 missed fieldgoals on the game, two coming from short range. 51-32 win over Eastern Kentucky: This game had the promise of a last-possession wins the game battle going into the half as Costal held a 31-24 lead. In the 2nd half of the game though Coastal buckled down on defense and kept EKU from scoring until a TD with 40 seconds left on the clock. By then it was well out of reach. Coastal ran for 340 and passed for nearly 300. EKU did pretty good on offense as well 185 rushing, 300 passing. Coastal lost two fumbles, one was taken for a score early on. 50-17 win over Hampton: Coastal went big on the ground, rushing for over 380 yards as they pummeled Hampton. Coastal controlled the clock with almost 37 minutes of TOP, went 12 for 16 on 3rd down, and were a perfect 8-8 in the red zone. 53-28 win over Elon: Another game where the first half was close but Coastal adjusted and shut down the opposing team in the 2nd half. It was 32-28 Coastal at the half. But the 2nd half was a totally different story, Elon had only one drive (in 7 possessions) where they even got a 1st down and that one drive resulted in a missed fieldgoal. Coastal put up huge numbers, over 650 total yards While Elon was held to 333 total where 246 of that came in the 1st half and the other 87 came in the 2nd half. 42-7 win over Gardner-Webb: Almost a downer for Coastal, the fact that they didn’t eclipse 50 points scored and had just 380 yards of total offense. GWU had 4 turnovers including a pick-6 in the game. 55-52 2OT win over Liberty – That must’ve been a fun game to be at. Liberty finished the year 7-4 I believe, so they’re no slouch of a team. Liberty was consistent in scoring the first 3 quarters, 14 points per quarter. Halfway through the 3rd Coastal was down 42-23, things weren’t looking good. But then they scored right at the end of the 3rd, forced a Liberty punt, scored another TD, and then held Liberty to a fieldgoal. The score was now 45-37 with Coastal getting the ball back. With a mix of quick passes and QB draws Coastal went down the field and scored a TD and got the 2-point conversion with just 40 seconds left in the game. In OT, Liberty scored on their first play, Coastal answered in 4 plays. In 2OT Coastal started with the ball but stalled and kicked a fieldgoal. The Coastal defense rose to the occasion and didn’t allow Liberty to get a first down and then blocked a would-be game tying fieldgoal to win the game. Each team ran for 235 yards, Liberty passed for 400 while Coastal passed for almost 320. 66-27 win over VMI: I’m seeing a trend here with Coastal. This game was again, looking close at the half, with Costal hanging on to a 30-24 lead. Once again, Coastal buckles down and holds VMI to hardly anything in the 2nd half while they continue to score as they see fit. VMI had 410 balanced yards of offense, but Coastal had 500 total yards, 300 of which came on the ground. 50-25 win over Charlotte: Not like some of the closer games but again, Charlotte got its yards and points for the most part in the 1st half and was shut down in the 2nd. Charlotte did put up 500 total yards but had two long drives end in interceptions and another on downs. 26-31 loss to Charleston Southern: Charleston Southern was presumably a playoff bubble team, they were 9-1 coming into this game and finished 10-3 on the season. CSU opened strong while Coastal was totally flat, CSU held a 24-6 halftime lead. Coastal’s first 3 possessions were all 3 and outs. CSU opened the 2nd half and scored again, going up 31-6. Then Costal started to get rolling, they quickly answered with a TD of their own. CSU was held scoreless but did chew a lot of clock in each possession, which really killed Coastal’s chance to win the game. Coastal did score on their last two possessions but thanks to CSU holding the ball so long they never got a chance to get the ball back. Coastal scored with 6:30 left in the game, kicked the ball away, and never got the ball back. CSU had a whopping 40:34 of TOP. Coastal’s longest time of possession on a drive was 3:21, they had two Touchdown drives at 1:15 and 1:19 of possession time. CSU got it done on the ground, 325 rushing yards, with another 200 passing (although going -2 in turnovers). 46-13 win vs Presbyterian: Back on track Coastal put up almost 650 yards of total offense, 400 on the ground. It was a total beat down, Presbyterian didn’t get any points until two late scores. 10-70 loss vs South Carolina: No shock here, South Carolina was a TAMU win vs Missouri away from playing in the SEC title game. Coastal was held to less than 300 total yards while SC had almost 650. 48-24 win vs Bethune Cookman: In their first round playoff win Coastal held a good sized lead against what was one of the better ranked defenses in the FCS (although it was a MEAC school, a conference that’s never won a playoff game). Coastal was up 41-10 and allowed a few late scores. I know a lot of us watched this game, or at least followed it. It was another balanced game for Coastal, 256 passing, 217 rushing. They did give up 460 total yards but over 40% of those yards (188) was given up in the 4th quarter when the game was over. #15 Lorenzo Taliaferro, running back – Taliaferro is one of the better running backs in the nation. The 6-2, 230 pound back is a load, the work-horse kind of back this offense relies upon. He’s got 1572 rushing yards and 24 rushing touchdowns. He’s also 5th on the team in total receptions, although just 109 yards there on 19 catches and 2 more TDs. He’s a Payton Award finalist and on many NFL draft lists as a free agent prospect at this time. #4 Alex Ross, quarterback – The first year starter has found a good stride. He’s got 2706 passing yards this year (225.5 per game) and has 22 TDs to just 7 INTs. He’s a rushing thread in the zone-read they operate out of, he’s got 403 rushing yards this season and 6 rushing TDs. #84 Matt Hazel, wide receiver – Coastal’s system utilizes a lot of wide receivers, Hazel has the highest stats of the group. He’s got 881 receiving yards this year and 8 TDs. He leads the team in catches, yards, and TDs. He’s a big target at 6-3. I assume he’ll rotate around the field so he’ll get everyone in coverage, but I’d expect Goodwin matches up on him the most. #11 DeMario Bennett, wide receiver – Another taller WR at 6-2, Bennett is 2nd on the team in catches and yards. He’s got 582 receiving yards and 5 TDs this year. #31 De’Angelo Henderson, running back – A chance of pace back that will get some touches, has more yards than Ross but far fewer carries. 541 rushing yards and 5 TDs on the season. Also just looking at the stats #8 Travis Small might be another guy to keep an eye on. They use a lot of running backs. #20 Niccolo Mastromatteo, wide receiver – 3rd on the team in receptions Niccolo has 348 rushing yards, he’s also the main punt returner with a 6.3 yard per return average. He did lead the team in catches and I think yards in the BCU playoff win. Much like the running backs, Coastal has a stable of receivers they use, #3 Tyrell Blanks a WR, #19 John Isarel and #5 Thomas Pauciello a TE will catch some passes assuming they’re playing on Saturday. #27 Devin Brown, wide receiver – Not a guy to watch in the passing game but in the return game, he’s a dangerous kick returner. Has a TD this year and averages 25 yards per return. Little guy at 5-8, 155. #30 Quinn Backus, linebacker – Expect #30 to be in on just about every run play. He’s got 126 tackles this year and 10 TFLS with just 1 sack. He leads the team with 3 interceptions as well. #10 Mike McClure, linebacker – 2nd on the team with 84 tackles, he’s got 7 TFLS, 3 QB hits, and 1 recovered fumble. #23 Richie Sampson, safety – This guy has 3 forced fumbles on his resume already. He’s got 73 tackles this year, 3 sacks, and 1 interception as well. #25 LaDarius Hawthorne, whip – listed as the “whip” which I had to google search, it’s a DB-LB hybrid. This guy is their Jordan Tripp kind of guy when it comes to big plays. Where he’s not like Tripp he’s got just 45 tackles. Other than that he’s got 4 TFLS, 1 sack, 1 interception, 2 recovered fumbles, 2 forced fumbles, and has blocked 3 kicks (wow). Keep an eye on this guy, especially when lining up for fieldgoals and PATs. 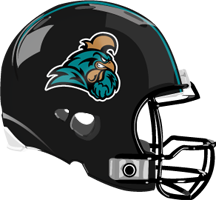 – Coastal Carolina is scoring 43 points per game with an average of 263 rushing and 230 passing yards per game, which totals at 493 yards per game. Compare that to the UM defense which is allowing 21.3 points per game with an average of 132 rushing yards and 241 passing yards allowed per game, which totals at 373 yards per game. – Coastal on defense is allowing 28.8 points per game with an average of 206 rushing yards and 232 passing yards per game allowed, which totals at 438 yards per game. The Grizzly offense is averaging 37.9 points per game on 187 rushing yards and 258 passing yards per game, for a total of 445 yards per game. – Coastal is +6 in turnovers, although they don’t commit or force many, just 12 lost turnovers to 18 forced. Meanwhile the Grizzlies are +18 in turnovers, with 13 lost turnovers to 31 forced turnovers. – Coastal in the red zone scores TDs 79% of the time and comes away with some kind of score 92% of the time. The Grizzly defense allows RZ touchdowns just 50% of the time or any sort of score 69% of the time. – Coastal’s defense in the red zone allows TDs 63% of the time and some sort of score 77% of the time. Meanwhile the Grizzly offense is scoring TDs 69% of the time and some sort of score 79% of the time. – Despite some games with heavy TOP control, Coastal is a quick-score/high speed offense, their average TOP is 27:33. – Coastal’s net average on punts is just over 34 yards (Griz are 38) where the Griz are averaging 44 yards per punt (the Johnson punt TD hurt the net yards number) Coastal is 37.5 average. Maybe not the best punter, or maybe they don’t need to punt it that far b/c their offense moves the ball a lot. – Coastal is a solid fieldgoal kicking team. 12-15 on the year. – The Chanticleers convert 3rd downs 53% of the time on offense, the Griz allow conversions 41% of the time. Meanwhile Coastal’s defense allows conversions 43% of the time which is great for the Griz because they also convert 3rd downs on offense 43% of the time. – The game summaries probably gave you this hint but Coastal in the first half allows a lot of points on defense, but tightens down big time in the 2nd half. 60% of all the points their defense has allowed has come in the 1st half. Compare that to the Grizzly offense who is a little more balanced across all 4 quarters, but has their best scoring quarter in the 4th. – On the other side, Coastal scores at will all of the time, 150 points in the 1st qtr, 150 points in the 2nd, 109 in the 3rd, and 130 in the 4th. The Grizzly defense really buckles down in the 3rd and 4th quarters, they’ve allowed just 89 total points in the 2nd half for the entirety of this season. – Contain #15. Taliaferro is a major part of the offense and is their biggest scoring threat. He’s going to be a bear of a player for the defense to handle. I don’t know if “shutting him down” is totally possible, but keeping him in check and making sure he doesn’t get frequent trips to the end zone will be huge. – Disrupt the offense. Coastal is going to pose a challenge here, they’re quick, attack with fast passes, mis direction, and zone-read. If the Grizzly defense gets over-aggressive they’ll get out of position too much. Also our base 4-3 defensive front will immediately set up a lot of mis-matches in favor of Coastal in the slot. The defense will need to break apart their rhythm and slow them down. Hit that mobile QB a lot, make him pay for running the ball. Also JP and Tripp will need to play the games of their lives on Saturday. – Ball control. Looking at the one relevant loss Coastal had it was done with ball control and clock-killing drives. A hurry up offense goes cold when it has to wait forever to even get the ball. I think a steady dose of run plays and short passes to chew up the game clock is a better recipe to beating Coastal than trying to out-gun them. – Force turnovers. Interesting to see, Coastal doesn’t commit a lot of turnovers, where the Griz force a ton. Some well-timed turnovers that set up short field or kill a good drive could take the wind out of their sails. Need to win the turnover battle on Saturday. – Win in the red zone. Easy to say, tough to do, and this has me worried. Coastal’s defense isn’t the best but it does stiffen up in the red zone. Montana’s D is great in the red zone and they’re going to get the best red zone offense I believe they’ve faced all year. If Coastal is kept out of the endzone, they’ll just punch a fieldgoal through. The Griz though… just not sure where we are with kicking right now, add in The Chanticleers have a reputation for getting after and blocking kicks. – Counter-punch their halftime adjustments. Maybe it’s me but reading their stats and summaries it seems that Coastal opens games guns blazing and lets their opponents do the same. They then adjust at the half and come out much more focused/prepared/adapted on defense. That’s how they’ve won quite a few games. The Griz cannot let that happen or else it’ll be a short playoff run for them. – Don’t get comfortable with any lead. Coastal’s got a ton of Oregon-esque touchdowns, 4 plays, 80 yards, 1:15 TOP. – Punish the QB. This guy is going to get loose on some plays, that’s a given. Need to make sure he’s given a firm reminder of what’s waiting for him when he decides to scramble. – Return game is key. I see a Coastal Carolina team that doesn’t punt/kick the ball as far as the Griz, there’s going to be some chances for Ellis and John or Chase to flip the field. On the other side they’ve got a real dangerous kick returner, do not get out of your lanes and keep that dude under wraps. I see a real battle here. Griz fans are saying Coastal looks small, will not like the weather, will be intimidated a Wa Griz… I don’t see that. They’re a very good team, like I said, the 2nd best team the Griz will have faced all season, 2nd to just EWU. They’re talented on offense and while they don’t have a lot of playmakers on defense they do make great adjustments and are great with bending but not breaking. Now we all know in 2009/08 the one difference was the Griz used a single main target at WR, Marc Mariani, while Coastal Carolina spreads the ball much more. Comparing WR numbers just shows how incredible Mariani was as a player in both 08 and 09. So as I see this, in the backfield, QB and RB… this is the 2008 Griz. The numbers are there, not just the scheme. So don’t expect some undersized offense that’s going to be overwhelmed and unable to get things done. This is a very good group. Do I think the cold will be a factor, since you know, we’re dedicating 2-3 threads daily to it? Maybe a little bit, but not a lot. Where it could come into effect is if the Griz can get long, sustained drives together and keep those Chanticleers playmakers on offense cold on the bench. Do I think the noise will be a factor? Yeah I think it could help, they’re a hurry up offense and will need to communicate quickly to get plays out. A rowdy and disruptive crowd could cause some false starts, mis-communications, and errors. So show up and be ready. I think the Griz win, but I’m building more cases in my mind that could lead to a loss. Missing/taking too many fieldgoals instead of scoring TDs, not forcing turnovers, 3 and outs on our offense, missed tackles and YAC for the Coastal players. We’ve seen some good improvement of late and I hope a well-rested and prepared Grizzly team shows up on Saturday. If we get the Grizzly team that played the 2nd/3rd/4th quarter against the Cats, they’ll win. If we get the 1st quarter Griz… that’s trouble. It’s going to be tight, I’m thinking it’ll be a weird score with some odd stuff happening. I’ll go with a 36-32 Grizzlies win. Be a good game for the Griz to snack on “chickens”. Go Griz!!!! When was the last time coastal Carolina saw snow, let alone played in it? Totally agree. This team is good. Griz offense needs to play 60mins to win. Forget the weather, folks. It’s just not that big if a deal. They’ll have warm clothing and heaters. It won’t likely be the difference in the game. Thanks for the report….Go Grtz!! !